Is the world becoming more disenchanted? Doug Challenger, professor of sociology at Franklin Pierce University, looks into how religious thought is trending across the globe. 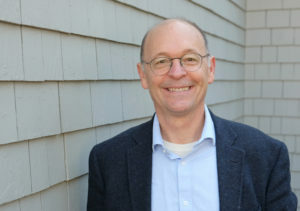 Douglas Challenger is a professor of sociology & documentary studies at Franklin Pierce University in Rindge, New Hampshire https://www.franklinpierce.edu/ where his research focuses on social and political theory, pilgrimage studies and the sociology of religion. His current project looks at the place of religion in post-secular societies. In recent years, Challenger has been studying the Camino de Santiago–a 1,200 year-old pilgrimage route in Europe–that lay untraveled for hundreds of years, but is once again surging in popularity among pilgrims and hikers from all over the world. In his research, he studies how the Camino functions as a bridge between the modern secular world and the spiritual world, and is among the most significant examples of a trend that blends the two worlds in new ways in the 21st century. He is the founder and faculty leader of Franklin Pierce University’s celebrated “Pierce on the Camino” program https://www.franklinpierce.edu/academics/studyabroad/camino/index.htm a semester-long international study program that brings a dozen students and a faculty leader to Europe to walk the long-distance journey along the sacred path dating back to ancient Celtic, Roman and Medieval times, and is walked today by thousands of people annually. Students travel between 10-15 miles a day on foot throughout the trip, which runs from August through October. Challenger https://www.franklinpierce.edu/academics/bios/challengerd.htm is also an independent documentary filmmaker. His current project, entitled “Perpetual Journey,” is an immersive documentary the follows five university students and their faculty leaders as they walk the Camino de Santiago trail. He earned his Ph. D., in sociology from Syracuse University’s Maxwell School of Citizenship & Public Affairs, and is the author of numerous scholarly articles and of the 1995 book Durkheim Through the Lens of Aristotle (Rowman & Littlefield Publishers). And for much of the 20th century it did seem to be the case that religion was declining in significance as modernization spread around the globe. But, since the turn of the 21st century, scholars and other observers are beginning to rethink the secularization thesis as world events and new trends seem to clearly point to the fact that a religious imagination and interest in the spiritual is still a strong aspect of social life almost everywhere. The Camino de Santiago – a 1,200 year-old Catholic pilgrimage route in Europe – is one example of today’s global spiritual and religious renaissance. These days, over a quarter million people a year travel this route mostly on foot and mostly as a kind of spiritual quest. While on pilgrimage to Santiago, people from diverse religious and secular backgrounds and identities walk together–engaging in the same rituals and practices like carrying a small stone or other item to leave behind, offering each other the same “Buen Camino” greeting, they become a community of fellow pilgrims attuned to mutual understanding and respect. Through its rituals and practices, the Camino pilgrimage is developing the “social imaginary” that will become more widely embraced as we learn to see modernity as a post-secular age, where religion and secularity no longer need to be experienced as antagonistic worldviews.